It is fitting that the postcard sent by Bruce Epperly for this Thanksgiving Week would take us to the Communion Table. As noted below, the sacrament of the Lord's Supper is a Eucharistic meal, and the word Eucharist comes from the Greek word "to give thanks." As we gather for meals, may these be times and opportunities to share in a time of giving thanks for God's abundance (an idea that Bruce loves to lift up in his writings). My course in the “Theology of Congregational Transformation” is made up five hearty souls, including a Swiss pastor on sabbatical at Claremont. On the day we were to talk about Sara Miles’ Take This Bread: A Radical Conversion, I invited the students to my on-campus apartment for an agape feast that turned out to be a Eucharistic meal. Sara Miles’ book is about mysticism and mission: raised as an atheist, Miles has mystical experience while taking communion and discovers that eating – feeding the hungry – is at the heart of her faith. She moves from the communion table to the food pantry and discovers God’s presence not only at the altar but in meals with the homeless, destitute, and lonely. Divine omnipresence is not just reserved for religious ritual but undergirds the whole of life for those with eyes to see and tongues to taste. Three of the students chose to lead a communion service, using the liturgy from Sara Miles’ Church, St. Gregory of Nyssa. We sang hymns accompanied by a violin and cello and one student read a poem on communion, inspired my Miles’ book. What a joy it was to sing with the accompaniment of strings! Communion led to study and feasting – cheese, grapes, vegetables, juices, pot stickers, and freshly made bread, remaining from the communion celebration. We savored our food as we reflected together on the importance of food in the spiritual life. 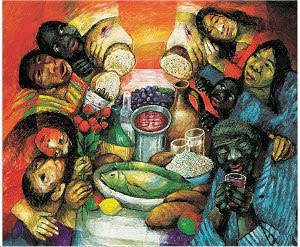 We share in the communion meal so that all meals might become Eucharistic, sacramentally reminding us that all things and persons are holy and every sense can be an avenue of revelation. Every meal can be a holy communion when we pause long enough to give thanks for grain and grape, bakers and clerks, and all the hands that brought us our these simple gives of bread and juice. Good teaching joins form and content. We reflect on a subject and then live it out in body, mind, and spirit. Learning can be gastronomical as well as cerebral and good teaching evokes head, heart, and hands in a tapestry of experience. It was natural then to illuminate Miles’ book with the celebration of communion and an agape meal. We truly feasted on her words as we broke bread together. Education is a holistic enterprise, bringing together head, heart, and hands, and inspiring students to taste and see holiness in the texts they are studying and, in digesting these texts, discovering ways to embody the world’s wisdom in everyday experiences of cooking, eating, celebrating, and re-creating as God’s companions in bringing joy and laughter to this Good Earth.